The Pause range of modular seating features contemporary sofas, benches, and stools that are modern in design with a sleek tubular frame finished in a smooth Chrome. This style of seating is perfect for areas that are minimalist in design and can be combined with a huge variety of decor. By opting for modular seating you are choosing a versatile, flexible style of seating that can be used in a number of applications. 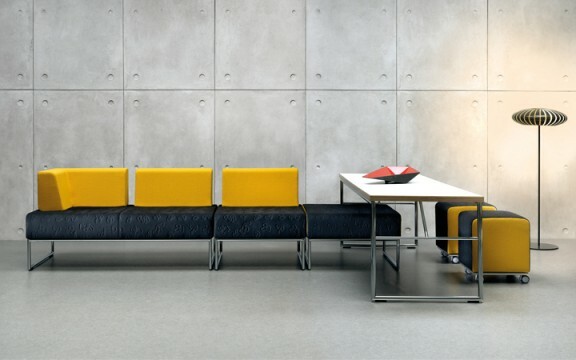 The Pause Modular range is perfect for break out areas, waiting rooms, reception spaces, staff rooms and executive settings. They can also be beneficial to the education sector and look great in colleges, universities, libraries and museums. Another application is retail as often around the changing rooms there is the need for some sort of seating for those waiting. The Pause range is stylish and works well in a fashionable environment. The seats are manufactured using moulded foam that is high density and guarantees comfort to the users. There is a wide number of fabrics to choose from as well as both faux and genuine leathers. Each fabric option itself has a large number of colour finishs to choose from. For example, the leather option alone is available in 45 colours including bright and vibrant ones such as Mandarin Orange, Banana, Flame Red, Deep Ultramarine and Very Grape. That is just one example of the amount of choice we have available with the Pause range. There are more fabrics available on request. To make the most out of this range take advantage of our free space planning service from our in house design team. They can work to find the most attractive configuration and tailor a seating solution to suit your application. This can ensure that you are utilising your space in the best way possible. Buy with confidence from Office Reality, one of the leading suppliers of office furniture within the UK. The Pause Range is available for free delivery to any UK mainland address.